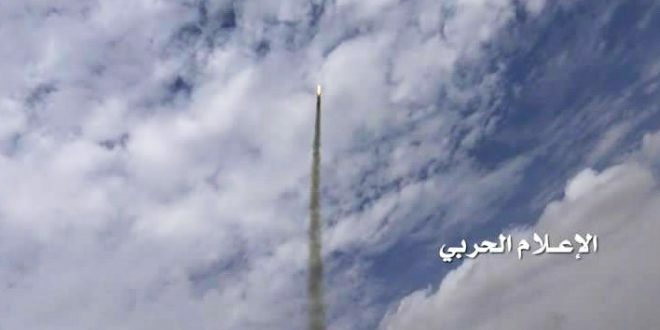 The missile force of the Yemeni army and popular committees launched on Thursday two missiles, one is locally made that targeted groupings of Saudi hostile mercenaries in Nihm district. The second missile bombarded a Saudi military site in Asir. Zelzal 2 have been fired aiming at Saudi mercenaries in Al Khaniq region in Hareeb Nihm, Sana’a governorate. The Yemeni missile hit its target with high accuracy, resulting in large numbers of killed and wounded, military source confirmed. In addition, the missile force carried out another operation against Al Hammad military headquarters in Asir using a “Grad” rocket. Speaking of the border region of Asir, artillery force targeted Al Masyal site’s surveillance in the same region.